Before my accidental entry into graphene, I worked on 2D electron systems, but I cared very little about what might support those electron systems, as long as I could probe their intrinsic properties. In my mind, materials and the periodic table were all the province of chemists, and since I was not a chemist, I decided that I didn’t have to worry about it. Then, in 2007, I went to a conference where Millie spoke about graphene, and I remember how she described its wonderful properties. When a material is really two dimensional and sp², such as graphene, it has amazing mechanical and electronic properties. The 2D electrons in this material are ultra-relativistic Dirac fermions which makes them behave in strange ways, like nothing we had seen before. Now, this answer completely stumped me, at the time. So I went back to the periodic table and checked, and it turns out that carbon is the only material in the entire periodic table whose ground state is sp². All the other ones in the fourth column are sp³, so they will not have graphene-like properties. Now, when you hear a speaker tout all the wonderful properties of graphene — highest mobility, highest thermal conductivity, the strongest material, and so on, and so forth — you will almost never hear about the magnetic properties. Why? Because graphene is not magnetic. In fact, it’s one of the most diamagnetic materials (other than non-superconductors) known. The reason for this is related to Lieb’s theorem, a theorem which covers classes of materials which have a bipartite lattice with a half-filled band. Now, a bipartite lattice means that you can take two colors, say red and green, and color your lattice so that every red atom is surrounded by green atoms, and every green atom is surrounded by red atoms. Honeycomb structure is, of course, bipartite. So are all cubic and square lattices. If you have a material like this at half filling, then Lieb showed that the spin of the ground state is equal to ½ times the imbalance of the population of the two colors (AKA the two sublattices). So, immediately, when you look at pristine graphene — with no holes or zigzag edges — you realize it has to be non-magnetic. In fact, it's a neat exercise to look at the list of all the diamagnetic materials and to figure out which ones of these satisfy Lieb’s theorem. 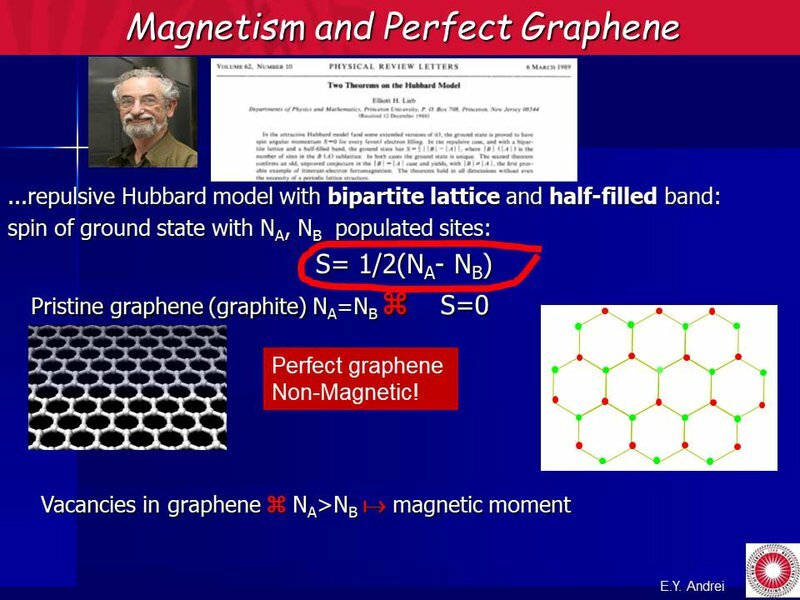 But another thing also becomes immediately obvious: namely that, if you make a hole in graphene by plucking out a carbon atom, then you have an imbalance, and you immediately create a magnetic moment. So this is a way to make graphene magnetic. What happens when you pluck a carbon atom out from the graphene lattice? Let’s analyze this in more detail. In the upper left, you can see an image of pristine graphene. 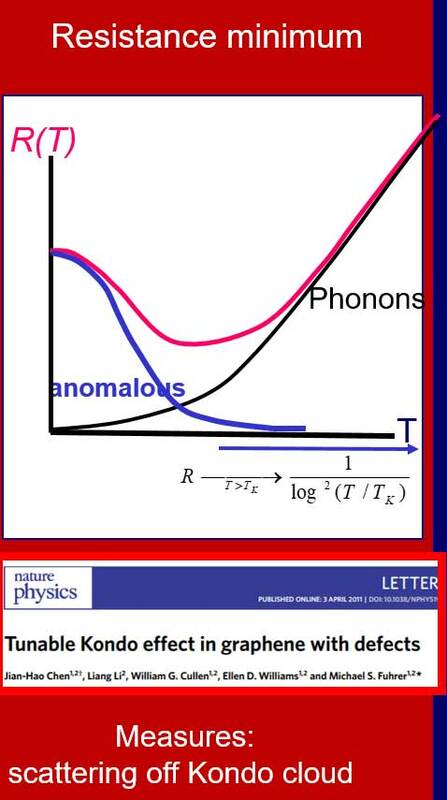 The π-band and the σ-band are marked below it, on the slide. 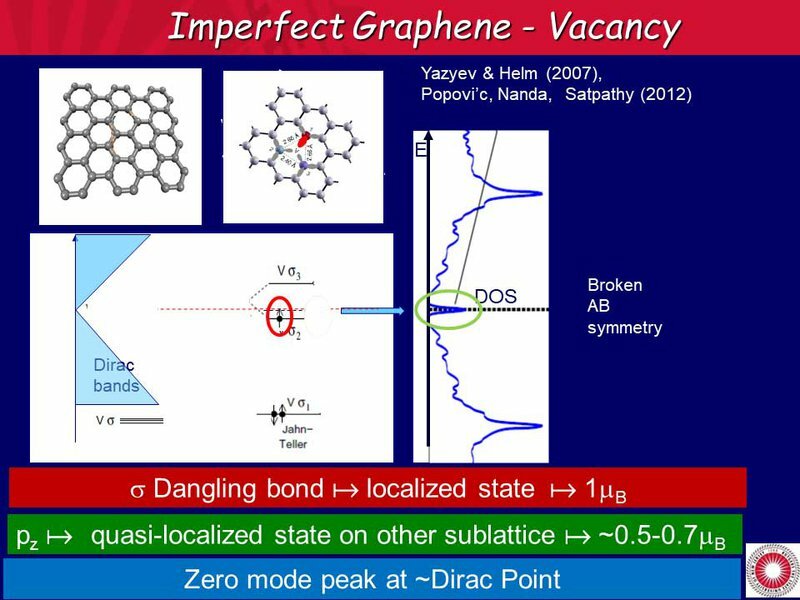 In graphene, every carbon atom in the lattice is using three of its valence electrons to create an sp² bond and bond it with its neighbors. The fourth electron, however, is free to move in the π-band, and it provides the electronic properties. Now, when we pluck out one carbon atom, three of those σ-bonds become free, and you have three dangling σ-bonds. Two of them will hybridize; there is a crystal distortion and then a Jahn-Teller splitting. The bottom line is that we are left with one dangling orbital, which I have circled in red, and that orbital can accommodate one electron that has a spin of ½. Therefore, from the σ-band, you get a spin of ½. Now, what happens to the electron that we plucked out of the π-band? That electron has a brother that is now unpaired, which will contribute another state (circled in green) with a spin of ½. It creates a peak in the density of states — a zero mode peak — whose origin is the broken sublattice symmetry. 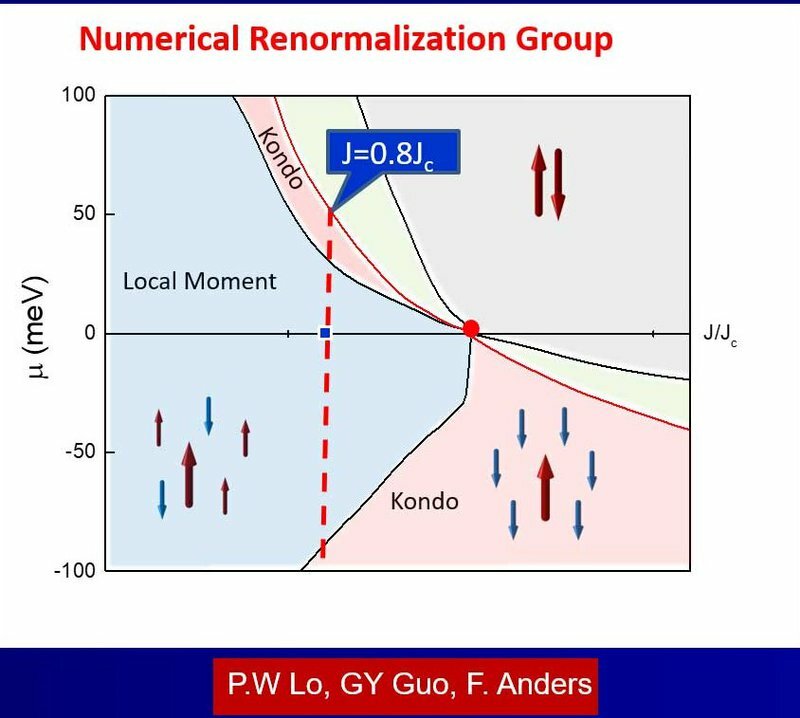 Thus, in the end, we have a net magnetic moment localized on the vacancy that is between 1.5 - 1.7 Bohr-magneton. This magnetic moment is well localized and stable. The question is, how stable is it? We know that, when you put a magnetic impurity in a metal, something strange happens at low temperatures. At high temperatures, you can see our impurity spin on the left (red arrow), and the conduction electrons (green arrows) surrounding it are randomly oriented so that the net magnetic moment of the impurity is unchanged. However, as you lower the temperature — if there is an antiferromagnetic interaction between the conduction electrons and the impurity spin as is usually the case — you’ll discover that there is a temperature below which the nearby conduction electrons align their spins to form a so-called Kondo cloud surrounding the impurity that completely screens its magnetic moment. In other words, you can no longer see the spin. We call this phenomenon “Kondo screening”. The temperature below which Kondo screening occurs depends on the density of states at the Fermi energy and the strength of the antiferromagnetic coupling. As long as these two quantities are non-zero, the Kondo temperature will be finite. This is fairly universal; it happens in nearly all metals. So, in normal metals, we always have some temperature (sometimes extremely low) where Kondo screening happens. In an insulator, however, it never happens — which means that, no matter how low the temperature is, the magnetic moment will always remain visible. But what happens in graphene? After all, graphene is not definitively an insulator or a metal — it’s kind of in-between. 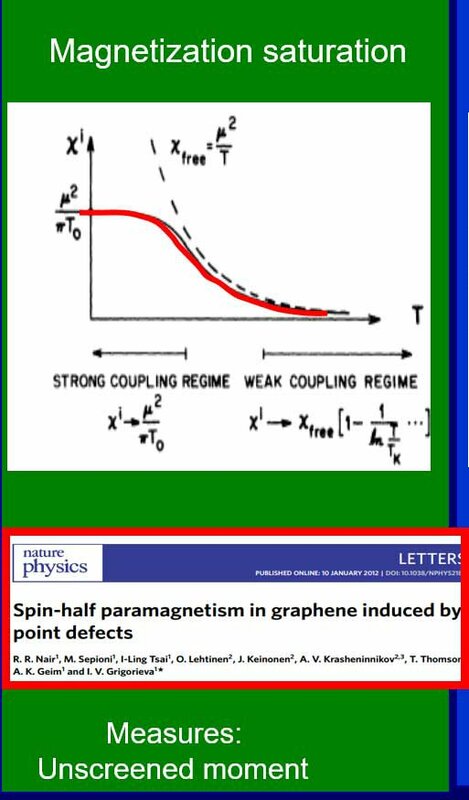 In charge-neutral graphene, the density of states at the Fermi energy is zero, but it increases linearly with energy. So what’s going on in such a so-called ‘pseudo gap’ system? This problem was dealt with in the 1990’s with the advent of the high Tc superconductor. For graphene and high Tc superconductors, the density of states is directly proportional to energy. Therefore, in these materials, the theoretical prediction is that if you plot the chemical potential versus coupling strength, and if you then sit at zero chemical potential (this is charge neutrality), there will be a critical coupling constant. Above this constant, you have regular Kondo screening. Below it, the magnetic moment remains unscreened at all temperatures. Now, if you are able to gate this material to change its Fermi energy, an interesting thing happens. 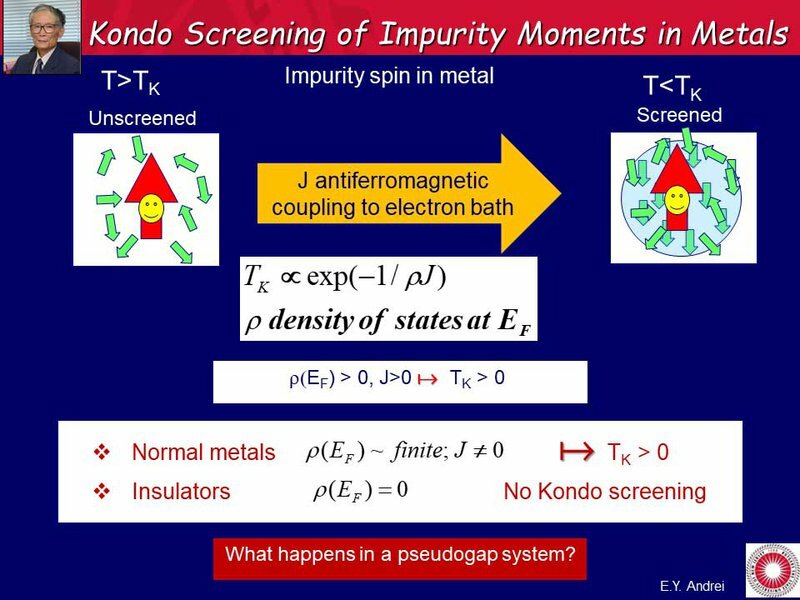 There is a finite region within which you have a finite magnetic moment, but as you continue to gate on the electron side or the hole side, you get regular Kondo screening. So this, immediately, gives us an opportunity to turn the magnetic moment on or off at a whim! We can accomplish this through gating or, if you’d rather, by changing the coupling constant (although that is a little harder). How can we detect Kondo screening in regular materials? What are the techniques? There are basically three techniques that we can use. The first way (Technique #1) is to look at the temperature dependence of the resistivity. 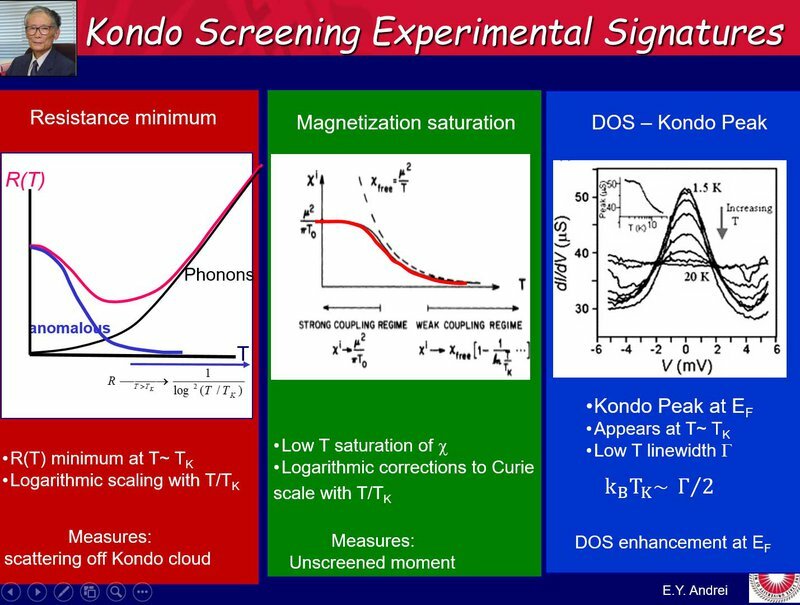 When there's Kondo screening, there's going to be a minimum resistance that occurs when the Kondo cloud first forms, and then the enhanced scattering will cause the resistance to go up at low temperatures. 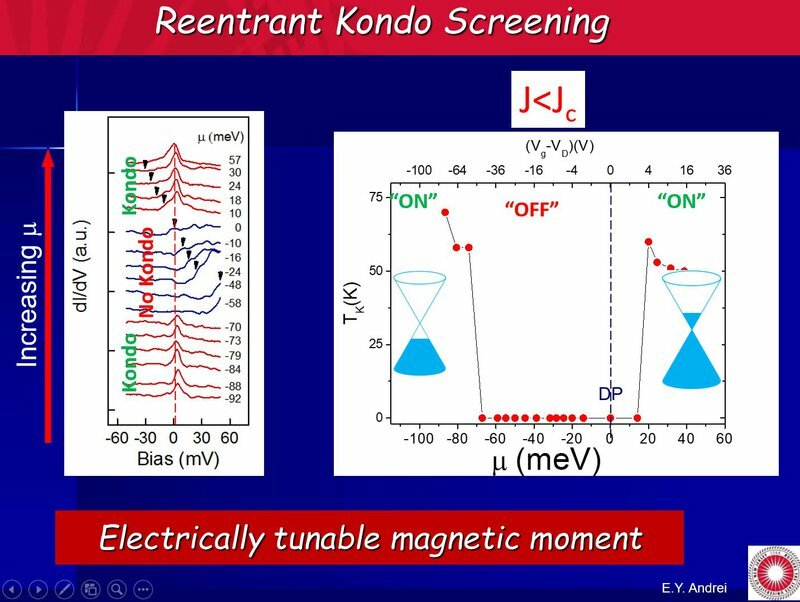 The second way of seeing evidence of Kondo screening (Technique #2) is to examine the magnetization. At a high temperature, we have the regular Curie behavior. However, below the Kondo temperature, there is a saturation. That saturation indicates that the magnetic moments are being screened. The third technique (Technique #3) is to analyze the density of states. Because of the formation of the Kondo cloud, you have a density of state peak at the Fermi energy. The width of that peak is actually a measure of the Kondo temperature. Now, you may think that these different methods are interchangeable, but they may not be. When different groups use each method, they will sometimes arrive at the opposite conclusion. One year later, however, a paper came out from the Manchester group, who used a similar system but measured magnetization, instead. That’s technique #2. When they did so, they saw Curie behavior all the way down to the lowest temperature. 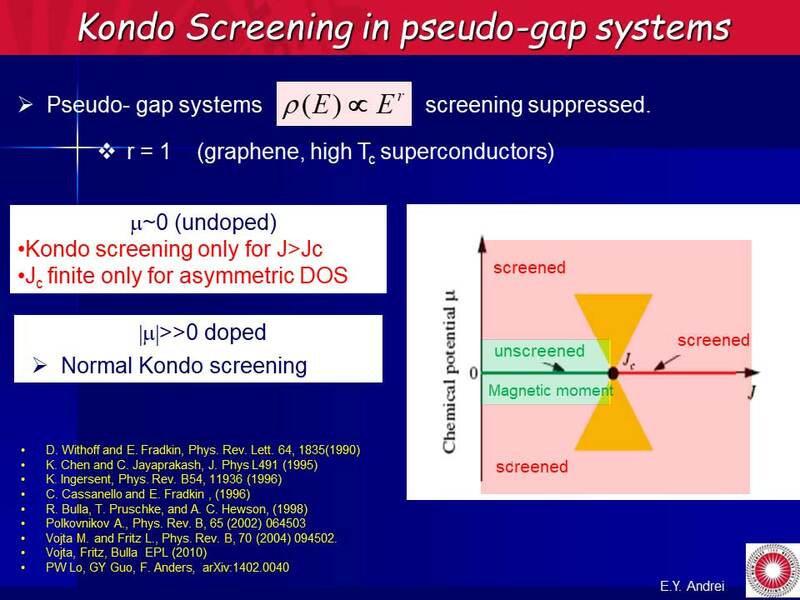 That indicates that there is no Kondo screening in this pseudo-gap system! So as you can see, there’s a big controversy in the scientific community about what, exactly, is going on. 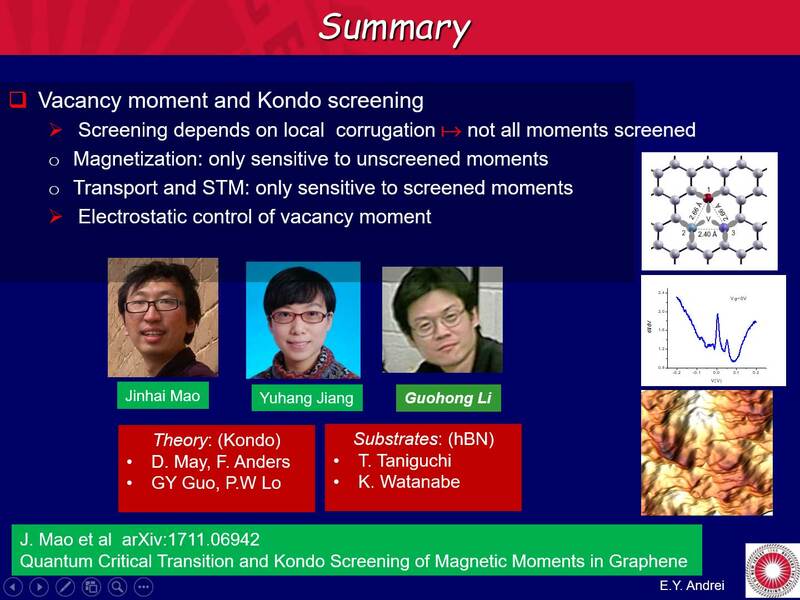 Is there Kondo screening in graphene? Or is there not? And why do both techniques give such different results? Well, my group thought about this, and we decided to try using Technique #3 — analyzing the density of states. How do we go about it? Well, this is an STM experiment. So we did a topographic measurement of pristine graphene, then bombarded it with low energy helium ions. That created defects, which are easily visible in the topography. When you zoom in on one of these defects, you’ll see a triangular structure, as shown above, which is the signature of having a single atom vacancy. Now, another thing that you can do with STM is STS spectroscopy. So you look at the density of states far away from the vacancy, and you see this kind of V shape structure. We identify that the Dirac point is the minimum, as is marked in green with the DP label — and the Fermi energy sits at exactly zero. This was expected, of course; it’s basically the density of states of pristine graphene. Then, we repeated the measurement at the center of the vacancy. That time, as indicated in the lowermost graph, two beautiful peaks had appeared! So the green one (the one at the Dirac point), we identify with the Zero Mode. The peak at the Fermi energy (red) is our candidate for the Kondo peak. Now, in order to verify that, we’ll have to examine whether the Kondo peak does, indeed, pin to the Fermi energy. Look above and you can see that if we change the gate so that, starting in the deeply hole doped regime, we move towards charge neutrality, sure enough the peak is stuck to the Fermi energy. I’ve noted this above with the green dotted line. 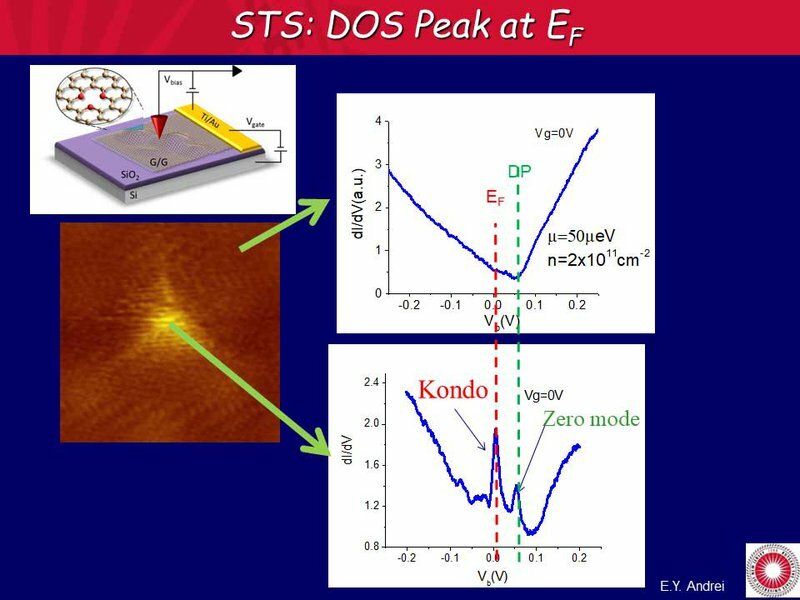 Doping: the intentional introduction of impurities into a semiconductor to change its properties.
. You can see, in the figure, how it changes as we continue to dope it past the Dirac point and into the electron doped sector. Basically, what’s happening is this: as you approach the Dirac point, the Kondo peak disappears for a while, and then it suddenly reappears, again, on the other side! Now, as I summarized before when explaining Technique #3, we can use the line width to determine the Kondo temperature. So we did, and we found it was pretty high — about 75K, in this case. However, we have seen it get close to 200K. This is very interesting to us, because it means we have a way of turning the magnetic moment on and off. Because this impurity vanishes at charge-neutrality, we can say that the coupling constant must be below critical. 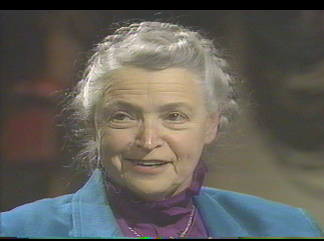 In order to make progress, from this point on, we needed to talk to theorists. 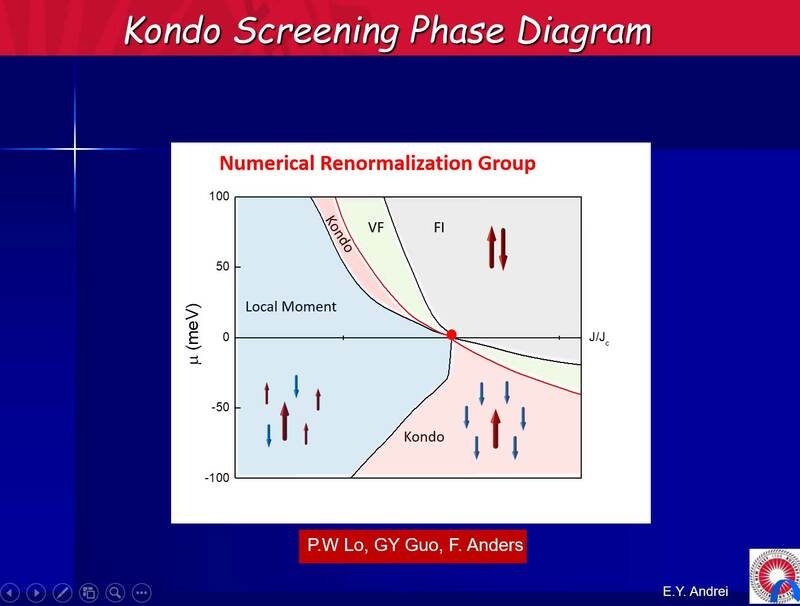 So we asked our theorist collaborators (they use a numerical renormalization group theory) to calculate the phase diagram of this Kondo screening. 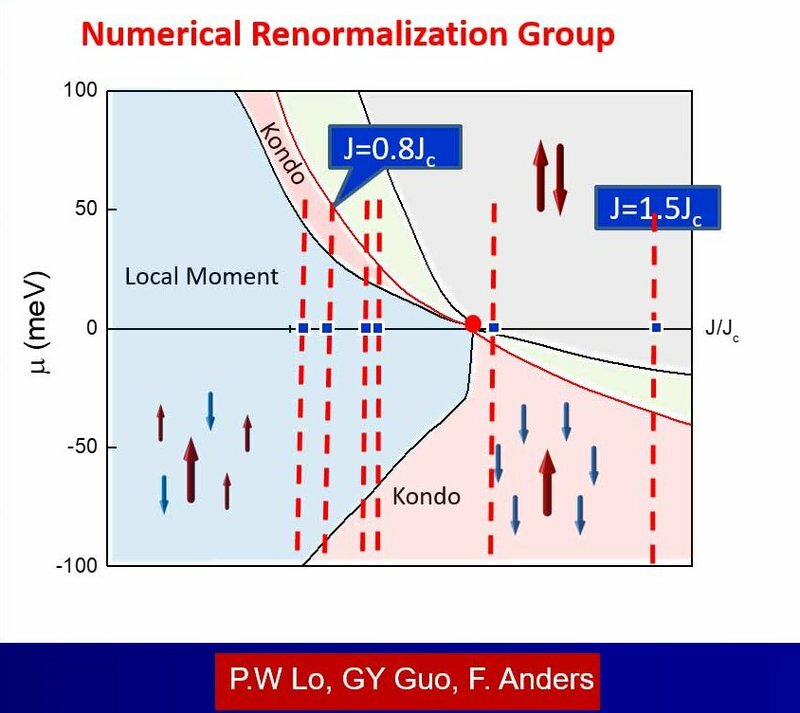 This shows the different local-moment and Kondo screening regimes on a plot of chemical potential versus coupling (J) measured in units of the critical coupling. 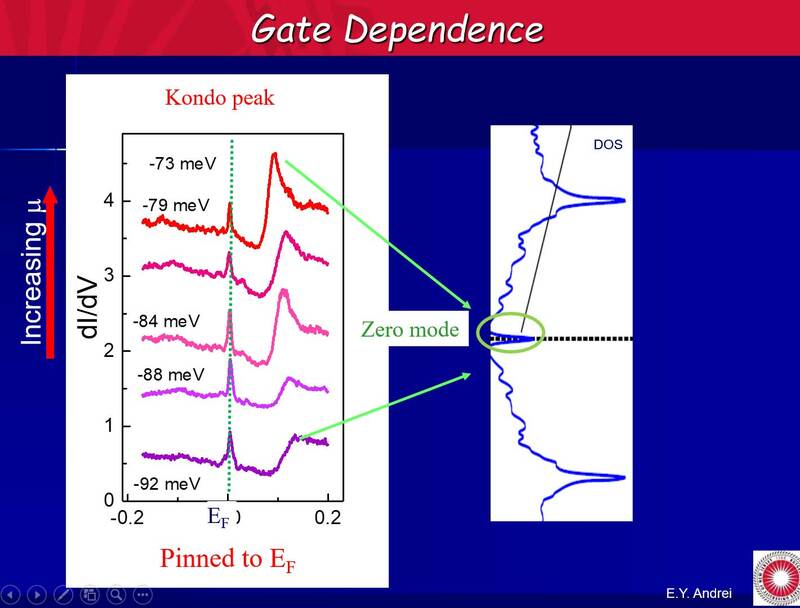 And, as you can see, there is a sliver of Kondo screening in the electron doped region area marked, and another piece of Kondo screening in the hole sector (also marked). The data I just showed you sits right at the marked spot, meaning that the coupling strength for this vacancy is about 0.8 of the critical value, which puts it in the subcritical regime. So then we went to other vacancies, expecting that they would all sit around that spot, as well. However, to our surprise, we got coupling strengths all over the map — all the way from subcritical to supercritical. And these were totally reproducible for a given vacancy. So what's going on? To answer that question, we needed to go back and understand where the Kondo screening is really coming from. So, here, we’re back to the vacancy. 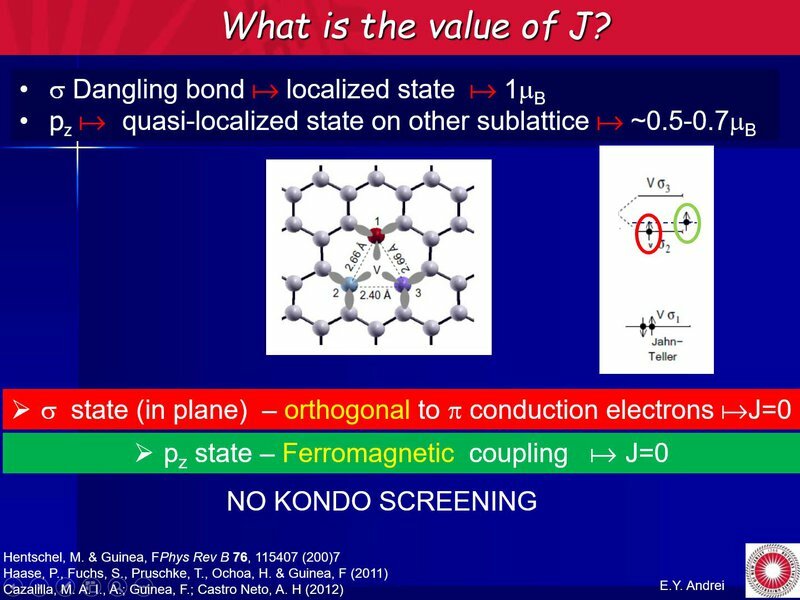 We have one spin that comes from the dangling σ-bond, and that state is orthogonal to the π-conduction band so it cannot be screened. If the states are orthogonal, you cannot form a Kondo cloud. The other state sits in the π-band. That one is coupling to the conduction, but it's ferromagnetic — so, again, the coupling is zero. Therefore, there shouldn't be any Kondo screening, which means we should agree with the Manchester data, because J is zero for both spins. What's going on is that, if you allow the dangling orbital to stick out of the plane, then, in fact, you do get finite coupling and, very simply, it’s the sine of the angle between the orientation of the orbital and the plane of the graphene sheet. Therefore, if you have a corrugated substrate with local bumps, you can get the σ-orbital to stick out, in which case, you get a finite coupling constant. This may explain why the different techniques have been coming up with conflicting results! To test if this is really the reason for the different results, we looked at three kinds of graphene samples, as shown above. Graphene on silicon dioxide (G/SiO2) is the most corrugated — as you can see on the graph above, we’re talking about the red line. The corrugation is on the order of 1.2 nanometers in amplitude. And the maximum Kondo temperature is 180 Kelvin, which means J is really large. Then, we took two layers of graphene on silicon dioxide (G/G/SiO2). This is not bilayer graphene; we’re actually just superimposing 2 layers. 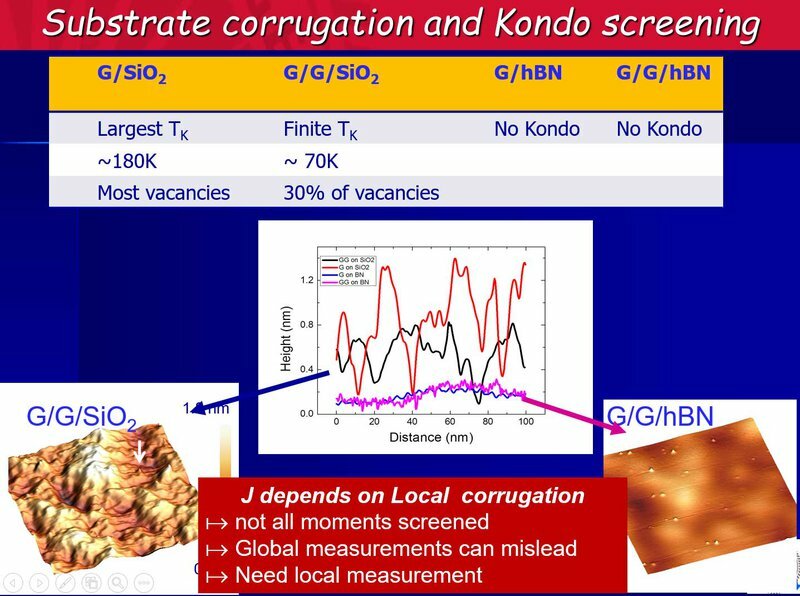 In this case, the corrugation is about half as large as it is for the single layer, and the maximum Kondo temperature is around 70 Kelvin, with only 30% of the vacancies showing a Kondo peak. Then, we put graphene on boron nitride (G/hBN) — either a single layer of graphene, or two layers. With this, the corrugation is about 10% of the corrugation in the other materials, and there's absolutely no Kondo screening. This data confirms the hypothesis that the effectiveness of Kondo screening depends on how much the orbital sticks out of the plane. The more the substrate is corrugated, the larger the local curvature at the vacancy sites, the more the orbital sticks out of the plane so the higher the Kondo temperature. 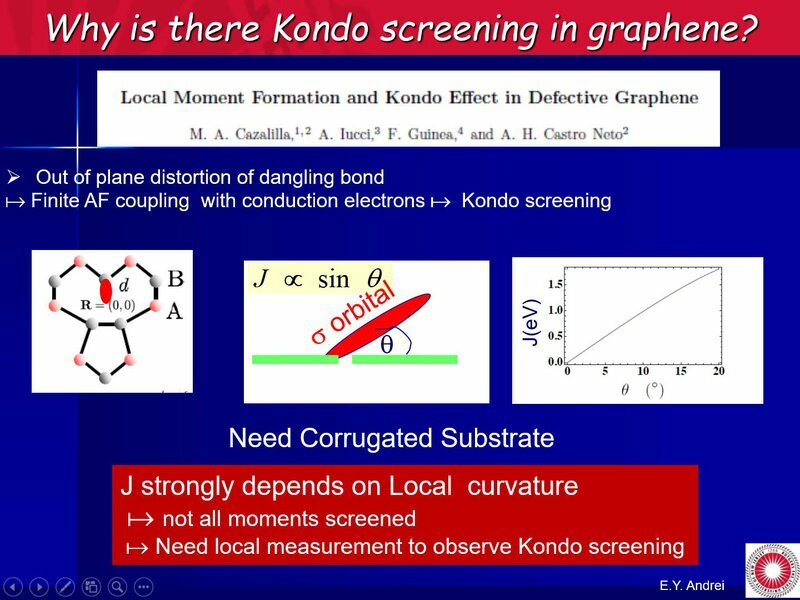 The bottom line is this: if the coupling constant depends on the local corrugation, then some moments are going to be screened and others not. Therefore, it’s important to keep in mind that overarching global measurements, such as resistivity or magnetization, that average over all the vacancies in the sample, can be misleading. 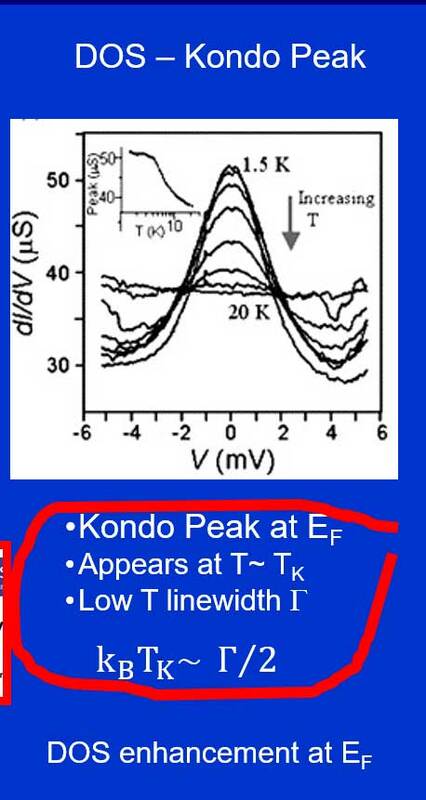 So when you use Technique #1 and measure resistivity, as was done by Fuhrer, you don’t actually get a good idea of what’s really going on — instead, you’re only examining the local moments that are Kondo screened. Why? Because you're basically measuring the resistivity as detected by enhanced scattering — but you’re scattering off the Kondo cloud! When you use Technique #2, using magnetization as a measurement, you’re also not seeing the full picture — instead, you only measure the moments that were not screened, because they are the only ones that contribute to the magnetization. But when you think about the problem like that, you realize that Technique #1 and Technique #2 actually have no overlap. So even though homogeneous samples analyzed with these two techniques usually do give you the same answer, for a case where not all moments are screened, you’d get a seemingly contradictory result. By doing Technique #3, which is a local measurement, you can immediately see that some spins of vacancies are going to be screened, while others are not going to be screened. This nicely resolves the controversy by showing that, in the end, no one was wrong — everyone was just looking at different parts of the whole picture! And here are the people who did all the work.